In 1996 the U.S. Federal Energy Regulatory Commission (FERC) issued its landmark Orders 888 and 889, creating a framework for competitive wholesale electricity markets. This coincided with the development of independent organizations – so-called “independent system operators” (ISOs) or “regional transmission operators” (RTOs) – that would operate utility-owned transmission networks under a single “open access transmission tariff.” Under FERC’s standards, RTOs would also be involved with congestion management, dispatch and scheduling of generation, administration of capacity and ancillary services markets, transmission expansion planning, and interregional coordination. The purpose of RTOs was to improve the efficiency of electricity markets. Competition was expected to replace the traditional vertically integrated market structure and lead to net economic benefits for producers and consumers. Unfortunately, such benefits never materialized. While FERC hoped that competitive wholesale electricity markets would span the entire continental United States, today’s RTOs only manage about 60% of the country’s electric power supply. Today there are seven medium-sized RTOs and hundreds of smaller vertically integrated markets. The result of today’s “balkanized” grid is that the overall economic benefits of competition are small while the regulatory costs are high. According to one energy law scholar, the multiple layers of regulation required to ensure the proper functioning of today’s fragmented markets “arguably exceed the overall regulatory burden present in traditional cost-of-service regulation.” To fix this, electricity markets should be greatly expanded. Under the traditional vertically integrated market structure regulation is focused on determining the utility’s costs and designing rates based on those costs. Conversely, under competition, regulation is focused on ensuring that no single company has an outsized share of market ownership. For any company to participate in today’s wholesale markets, FERC must deem that the company possesses neither horizontal market power (i.e. that it does not own an oversized share of generation facilities) nor vertical market power (i.e. that it does not own assets in upstream sectors, such as natural gas distribution, that could allow it to manipulate the market). Consider how FERC tests for horizontal market power, by what is known as the “market share” screen. This test determines the share of generation that the company owns or controls. While conceptually simple, it is complex in practice because FERC must take into account several factors such as the company’s long-term energy purchases and sales, the amount of capacity that the company keeps in reserve, and energy imports and exports. Calculating energy imports is an especially daunting exercise that is exacerbated by today’s highly fragmented markets. It requires FERC to conduct complex analyses to determine how much import capacity is available and how much available capacity exists in outside markets that can exert competitive pressure inside the market. Since there are many “outside markets” for any given competitive market, the complexity and cost of determining energy imports is large. Many other regulatory elements are similarly complicated because of market fragmentation. As a result, the overall regulatory burden is large. PJM, one of the wholesale electricity markets in the United States, spends almost $300 million per year on operational and administrative costs. This burden could be reduced if competitive wholesale markets were greatly expanded. 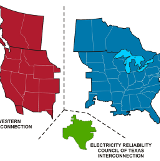 Particularly, FERC, Congress, state governments, Canadian provincial governments, and electric utilities should work toward the creation of three large markets that cover the continental United States and parts of Canada, and that correspond with the three existing major synchronous electricity grids (the Eastern Interconnection, the Western Interconnection, and the Texas Interconnection). There is a strong precedent for this type of expansion. The European Union has been pursuing a European-wide electricity market that will cover a land area that is comparable in size to the Eastern and Western Interconnections (and much larger than the Texas Interconnection). Moreover, it has been estimated that the EU-wide market could save member countries €40 billion ($45 billion) per year by 2030. Large competitive markets certainly do not eliminate the need for regulation altogether. Indeed, RTOs share many of the characteristics of public utilities and effective regulation is needed to ensure that market operators do not exploit market participants. The continued regulation of participants in wholesale markets is also required to ensure that no participant possesses undue market power. Nor do large markets address the challenges of transmission capacity expansion or the integration of low-carbon electricity sources. For these challenges, other forms of regulation are essential. My argument is simply that today’s fragmented markets impose significant unnecessary costs on consumers and producers of electricity. If governments and industry stakeholders could expand today’s fragmented markets to encompass much larger areas, and eventually the entire continental United States and southern Canada, such costs would be eliminated and the producers and consumers of electricity – that is, society as a whole – would be better off. See FERC Order No. 888, Promoting Wholesale Competition Through Open Access Non-discriminatory Transmission Services by Public Utilities; Recovery of Stranded Costs by Public Utilities and Transmitting Utilities, 75 Fed. Reg. 61,080 (April 24, 1996); FERC Order No. 889, Open Access Same-Time Information System (formerly Real-Time Information Networks) and Standards of Conduct, 75 Fed. Reg. 61,078 (April 24, 1996). See FERC Order No. 2000, Regional Transmission Organizations, 65 Fed. Reg. 810, 876–77 (Mar. 8, 2000); see also Michael H. Dworkin & Rachel Aslin Goldwasser, Ensuring Consideration of the Public Interest in the Governances and Accountability of Regional Transmission Organizations, 28 ENERGY L.J. 543, 554–57 (2007). See U.S. Energy Information, Today in Energy (Apr. 4, 2011), http://www.eia.gov/todayinenergy/detail.cfm?id=790. See William Boyd, Public Utility and the Low-Carbon Future, 61 UCLA L. REV. 1614, 1670 (2014); see also Lester Lave et al., Deregulation/Restructuring Part I: Reregulation Will Not Fix the Problems, 20 ELECTRICITY J. 16, 16 (2007). See Lincoln L. Davies et al., Energy Law and Policy (American Casebook Series), 399 (1st ed. 2014). See PA.-N.J.-MD. INTERCONNECTION, PJM 2012 FINANCIAL REPORT 21 (2013). See Christian Oliver, New EU energy chief shifts focus to building common power market (Nov. 13, 2014), http://www.ft.com/intl/cms/s/0/d1444394-6a71-11e4-8fca-00144feabdc0.html#axzz3SW85Z600 (paywall). See William Boyd, Public Utility and the Low-Carbon Future, 61 UCLA L. REV. 1614, 1673 (2014). Thank Max for the Post! Two of the Protect Our Power organization's senior advisors, former FERC Commissioner Suedeen Kelly and former New Jersey Board of Public Utilities President Richard Mroz, assert in this commentary in The Hill that "(t)aking strong, decisive.. In this whitepaper co-authored with my Wired Group colleague Dennis Stephens, we discuss the potential and challenges presented by grid modernization and emerging best practices in regulation and distribution planning processes. Duke Energy's.. In this whitepaper co-authored by my Wired Group colleague Dennis Stephens, we discuss the potential and challenges of grid modernization and describe emerging best practices in regulation and distribution planning processes. Duke Energy's.. In this whitepaper co-authored with my Wired Group colleague Dennis Stephens, we discuss the potential and challenges of grid modernization and emerging best practices in regulation and grid planning processes. Duke Energy's South Carolina Grid..